Teachers and administrators in many schools across the country have been buying “Now Discover Your Strengths” —- which is directed mostly to business managers —- for professional development. Now, they will be able to buy a version of this national bestseller written specifically for teachers. What do great teachers do differently? What separates the top teachers from all the rest? As educators — and American society in general – continue to struggle with how to improve schools in the U.S., these questions become more pressing than ever before. At the heart of any education system —- beyond principals, administrators, and school boards —- is the teacher. His or her role is so essential that The Gallup Organization has, for decades, directed some of the leading thinkers in education and psychology to uncover what makes a teacher great. 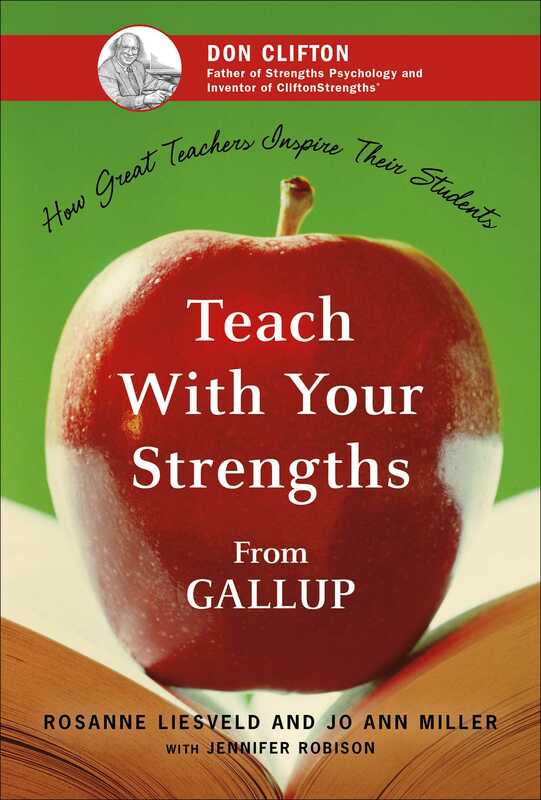 Written by two educators with a combined 70 years of experience in both classroom teaching and consulting with leaders of America’s schools, Teach With Your Strengths reveals the essential truths Gallup’s research has uncovered. But it zeroes on these monumental findings: While their styles and approaches may differ, all great teachers make the most of their natural talents. And, great teachers don’t strive to be well-rounded. They know that “fixing their weaknesses” doesn’t work — it only produces mediocrity. Worse, it squanders time and attention from what they naturally do well. In Teach With Your Strengths, readers will hear from great teachers: What they do differently; how they handle problem students; how they battle intractable school bureaucracies; how they break through and inspire even the most troubled young people. The book also shows that the best teachers take very unorthodox approaches to education that are sure to stir controversy and attention in the reading public —- especially among other educators! What’s more, readers of Teach With Your Strengths will be able to take an online assessment that reveals their Top 5 strengths, and the book explains how they can put those strengths to work in the classroom. As America’s educators read this groundbreaking book, they’ll discover their own innate talents as a teacher. And you’ll learn how to liberate those talents to inspire the next generation of students. Rosanne Liesveld, who began her career as a teacher three decades ago, has spent the past 20 years consulting with leaders of hundreds of schools all across the U.S. Liesveld played a key role in developing TeacherInsight, The Gallup Organization's online talent assessment for educators. She is now the Managing Partner of Gallup’s Education Division. Liesveld received a master's degree in adult education from the University of Nebraska-Lincoln. A member of the School Sisters of St. Francis, Milwaukee, for almost 50 years, Jo Ann Miller, who has more than four decades of experience in education, has spent the past 30 years consulting with and training educators in the United States and Canada. Through her seminar leadership, Miller has trained thousands of school leaders in the strengths-based approach to teacher and principal selection and development. She is a Senior Seminar Leader and Engagement Manager for The Gallup Organization’s Education Division, and received her master’s degree in history from Loyola University in Chicago.